Mars is the fourth planet from the Sun in the Solar System. Like Earth, Mars has a dense, metallic core region overlaid by less dense materials. Current models of the planet’s interior imply a core region about 1794 ± 65 km (1121 ± 41 miles) in radius, consisting primarily of iron, nickel and sulfur. This iron sulfide core is partially fluid, and has twice the concentration of the lighter elements that exist at Earth’s core allowing induced magnets to emerge due to planet spin speed of 868 km/h (542 miles/h) at the equatorial level and appear on the surface of the planet as fields of south magnet. The planet is tilted by 25.19° about the vertical axis to the solar plateau. As with the case of Earth, the tilting produces seasons cycles much like that on Earth. The lengths of the Martian seasons are about twice those of Earth’s, as Mars’s greater distance from the Sun leads to the Martian year being about two Earth years long. The Martian surface temperatures vary from lows of about −143 °C (−225 °F) (at the winter polar caps) to highs of up to 35 °C (95 °F) (in equatorial summer). 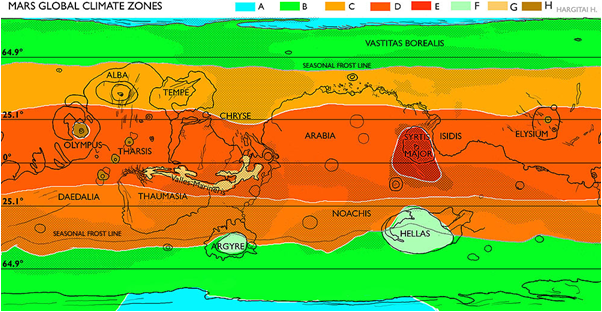 Mars Global Climate Zones, based on temperature, modified by topography, albedo, actual radiation. If the radiant energy of the Sun were directly responsible for the temperature variation on the surface of the planet, we should expect the region of close proximity that lies at a right angle projection to the Sun radiant energy path to be the hottest! Yet, the Martian temperature belts are tilted by 25.19° approximately than the region of close proximity to the Sun. They are much centered on the axis of the spinning of the planet. Scientists believe that Mars does not have the global magnetic field that, on Earth, is the source of the aurora borealis and the antipodal aurora australis. According to the physicists, the auroras on Mars are not due to a planet-wide magnetic field, but instead are associated with patches of strong magnetic field, primarily in the southern hemisphere which I tend to disagree and I will explain why. Earth has a magnetic configuration which is composed of A) two induced magnetic fields that are generated in the outer core. They are weak and appear in patches of south magnets in the southern and northern polar circles and B) one permanent magnet; the inner core, that is strongly fluxing out of Antarctica, circling around the planet and is observed as the Earth-wide magnetic field. Mars magnetic configuration is no different. 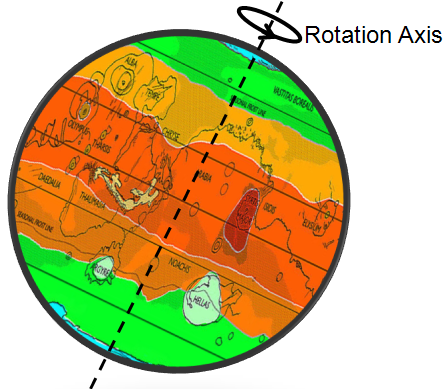 Part A: A relatively strong magnetic field force that peeks, along the rotation axis, through the planet geo-layers to reach its southern polar circle and loops back into the planet geo-layers, in parallel and in close proximity to the rotation axis, to flux out at the northern polar circle. Such magnetic field force peeks again through the planet geo-layer along the rotation axis to close the dipole north-south magnetic circle. 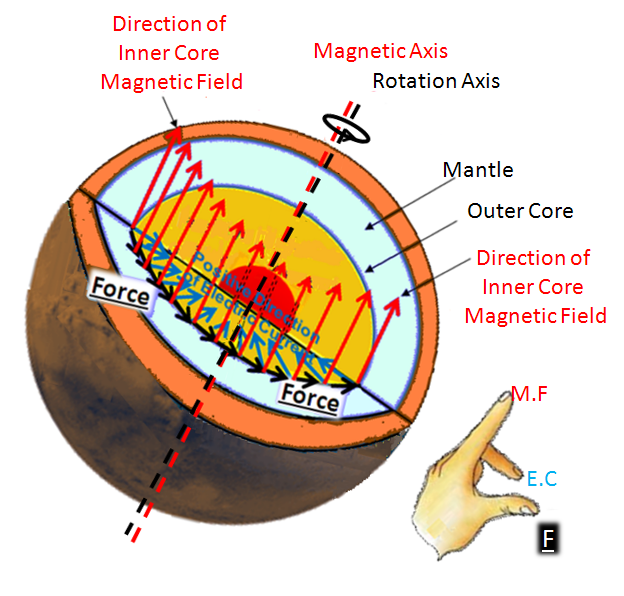 Part B: A mild magnetic field force that peeks, along the rotation axis, through the planet geo-layers to reach its southern polar circle and loops back to the surface of the planet to connect with the ring of patches of induced south magnets (Plasmoids) in the southern hemisphere of Mars causing aurora borealis. Part C: A weak magnetic field force that peeks, along the rotation axis, through the planet geo-layers to reach its southern polar circle and then loops back into Mars atmosphere to barely circumvent the planet surface from its South Pole to its North Pole. This explains the magnetometer readings of south, followed by north and then followed by south magnetic field orientation while Mars Global Surveyor was travelling a couple of hundred miles over Mars’ North Pole as shown in the following figure. Such a configuration of magnetic field force lines stands against the charged particles arriving from the Sun at high kinetic energy levels and, similar to Earth thermosphere, causes the protons to spiral along the magnetic field force lines between the Martian magnetic poles. The weaker the magnetic field, the faster and longer spiral-radius motion will the protons pick up, leading to higher thermal energy upon collision between such protons with one another at the Martian atmosphere. This explains that at the magnetic equatorial level, where the magnetic field is weakest, the collision’s thermal energy is at a maximum producing the highest temperature belt on the surface of the planet. 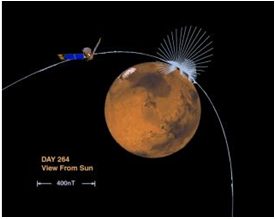 Where the magnetic field is at its maximum strength, the protons will move at slower speed and shorter spiral-radius, producing aurora borealis and generating the minimum thermal energy upon mild collision with one another on the Martian atmosphere. The approach of a ninth planet to the inner Solar System, causes some of the magnetic field force lines emerging from the south pole of Mars to route into space instead of following one of the three paths explained earlier. This causes the magnetic intensity to drop down allowing the protons to speed up and spiral at longer radii around the magnetic field force lines; gaining more opportunity to collide with one another and to generate greater thermal energy. Polar ice starts to melt and global warming is observed on Mars; much like what is happening on Earth. Needless to add, that Mars has similar spinning driver as with Earth. 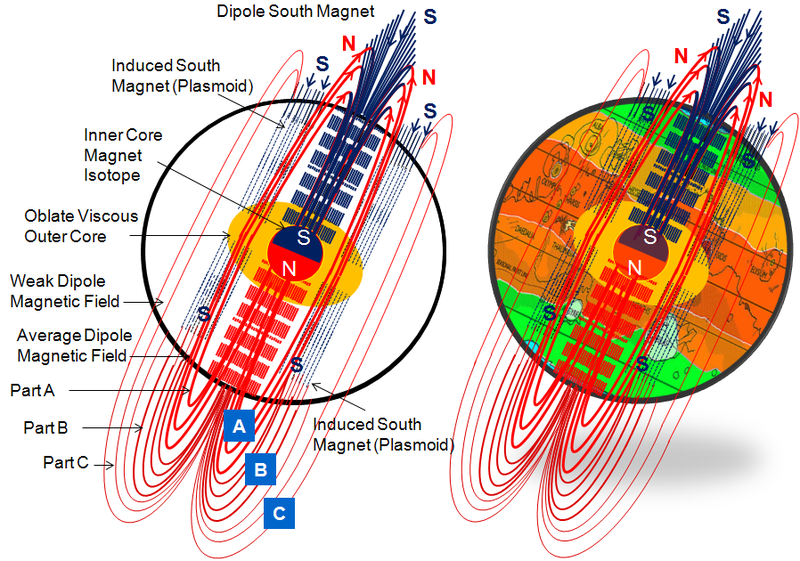 Refer to https://planet-earth-2017.com/what-makes-earth-spin/ and if the orientation of its permanent magnetic core is changed, the planet spin speed will change and may reverse depending on the resting angle between the magnetic field and the equatorial plane of the planet.